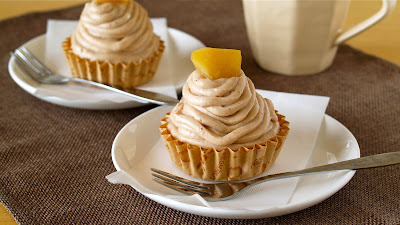 This is a quick and easy way to make delicious Mont Blanc!!! Instead of using sweetened chestnuts, you can also use leftover 栗きんとん (Kurikinton: mashed sweet potatoes with sweetened chestnuts) from New Year's food. 1. Mix marron cream, whipped cream, and rum in a bowl. Transfer it to a pastry bag and snip off the end. 1. Cut out sponge cake into round pieces, then place them on cupcake liners. 2. Place one sweetened chestnut and whipped cream in the center. 3. Pipe out the marron cream around the whipped cream. 4. Garnish with a sweetened chestnut and put in the fridge until cold. *You can top with some edible gold leaf for gorgeous finish if you have!